Dr. Schwichtenberg (pronounced Switzenberg) is a native of Wisconsin. He completed his undergraduate study in microbiology at the University of Wisconsin in LaCrosse, Wisconsin. 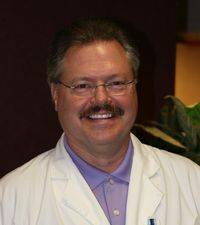 Dr. Schwichtenberg received his doctorate in Optometry from the Illinois College of Optometry in 1987. Dr. Schwichtenberg grew up on a dairy farm in southcentral Wisconsin. Long days of hard work on the farm have left Dr. Schwichtenberg with a tremendous work ethic. Whether it is getting your prescription just right or making sure your contact lenses fit perfectly, Dr. Schwichtenberg always gives you his best effort. Being raised in a household of nine children has given Dr. Schwichtenberg a calmness in the midst of a busy envirionment. No matter how busy we are in the office, you can be sure Dr. Schwichtenberg will take the time to talk to you and explain your problems to you in terms you can understand. Dr. Schwichtenberg in well versed in all areas of Optometry. He loves difficult contact lens fits and tough to diagnose problems. Whether you need laser refractive surgery, glaucoma treatment, new eyeglasses or contact lenses, you will be pleased with Dr. Schwichtenberg’s laid back, down home approach. It may come as no surprise that Dr. Schwichtenberg is a huge Green Bay Packer fan! If it’s Sunday and the Packers are playing you can find Dr. Schwichtenberg with his Cheeshead hat on rooting for his favorite team. Photography, painting, music, hiking, gardening and golf round out the other interests enjoyed by Dr. Schwichtenberg. In addition, Dr. Schwichtenberg has been a member of the Kiwanis Metro Club. He currently serves on the Quality Assurance and Improvement Board for the Tri-Cities Laser Center in Johnson City. All three doctors are members of the Northeast Tennessee Optometric Society.